Individuals with hearing loss can improve their ability to effectively communicate by using hearing aids. However, there are some settings where a hearing aid is not enough. Unwanted background noise or poor acoustics degrade the speech signal making it harder for the hearing impaired person to decipher the message. In order to overcome this communication barrier, amplified speech needs to be delivered with little to no distortion. This is accomplished by dramatically improving the signal to noise ratio (SNR) over that of a normal hearing individual’s requirement. This can be accomplished through the use of an assistive listening device (ALD) with or without the use of a hearing aid. What types of ALD technologies are available? 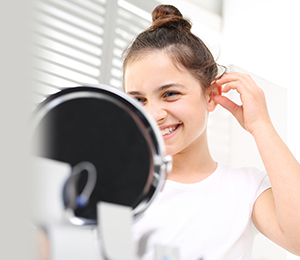 There are four common ALD systems that are used to address the needs of the hearing impaired: induction loop, frequency-modulated (FM), infrared, and Bluetooth®. This type of ALD system is beneficial for individuals who have telecoils (T-coils) in their hearing aids. A T-coil is a copper wire in a hearing aid that converts magnetic energy from the induction loop’s magnetic field back to electrical. The marriage between the induction loop system and the hearing aid significantly improves the SNR. It works by having a person speak into a microphone which converts the acoustical energy to an electrical signal. The electrical speech signal is amplified and then transferred to an insulated copper wire that encircles a room or a designated area within a room. As the electrical energy passes through the wire, a large magnetic field develops. When the hearing aid comes in close contact with the magnetic field, the magnetic energy is converted back to electrical by the hearing aid’s T coil. The hearing aid processes the electrical energy and then converts it back to acoustical and delivers it directly to the hearing aid user’s ear. This allows the hearing impaired person to receive a clear speech signal that has not been degraded by background noise or poor room acoustics. This type of system can be used in a variety of settings such as airport terminals, movie theaters, or conference rooms. Personal portable induction loop systems also are available for use in one-on-one conversations when background noise is present. An infrared ALD system uses light to transmit sound. This ALD has a transmitter that converts sound into infrared light before beaming it to a receiver worn by the listener. After receiving the infrared signal, the receiver decodes it back into sound. Since sunlight will degrade the infrared light, this system can only be used indoors. Infrared systems also require that the transmitted light be unobstructed. This type of ALD system is commonly used for watching TV, movies, and live theater. Hearing aids are not worn while using the infrared system. This ALD system uses radio signals to transmit amplified sound. FM systems are portable thus allowing the hearing-impaired person to use them in any listening environment that requires a better SNR. With this system, the speaker wears a small microphone that is connected to an FM transmitter. The listener uses an FM receiver that is tuned to the radio frequency of the FM system. Now the listener is able to hear the person speaking through earphones that are coupling directly to the FM receiver or through hearing aids that are directly connected to the FM receiver. Bluetooth® enabled hearing aids have finally arrived. Some of these devices allow the hearing aid to connect to Bluetooth® enabled devices (e.g. cell phones tablets, computers) through an intermediary device often referred to as a streamer. In this case, the Bluetooth® enabled device is wirelessly paired to a streamer that is wirelessly connected to the hearing aid. There are also hearing aid products that can connect wirelessly with Bluetooth® devices without the use of a streamer. Not only can phone calls be streamed seamlessly to one’s hearing aids but cellular telephone applications (apps) have been developed to allow the user to modify the hearing aid’s volume, and bass/treble parameters, as well as, the hearing aid microphone’s directionality. To find an assistive listening device for your individual needs, call Community Audiology Services or schedule an appointment online today.